2 of 4 In a large bowl, stir together tomatoes, zucchini, squash, fennel, onion, garlic, 1/2 tablespoon of the thyme, 1/8 teaspoon of the salt, the pepper and broth; set aside. 3 of 4 Lay four large pieces of foil or parchment paper (each 16 inches long) on work surface. Place 1-1/2 heaping cups vegetable mixture on lower half of each piece. Place fish on top of vegetables and sprinkle with remaining 1/2 tablespoon thyme and 1/8 teaspoon salt. Place 1 teaspoon butter on top of each fillet. 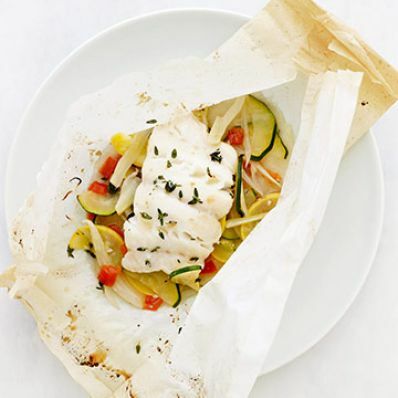 Fold foil or parchment over fish and fold edges to create a sealed packet. Place packets on a rimmed baking sheet, overlapping if necessary. 4 of 4 Bake at 450 degrees F for 20 minutes or until fish is cooked through and veggies are tender. Cut open packets and slide contents onto plates; serve immediately.